In a letter to Child Jesus, Ratzinger’s life agenda. Which the Pope restated in his most recent speech to the Curia A new Vatican financial controversy? Saint Stephen, first martyr, is an example of new evangelization. Because his story «shows that the news of the proclamation does not primarily consist in practising original methods or technics (which can of course be useful), but in being full of Holy Spirit and being guided by him». These words the Pope proclaimed during the 26th December Angelus are the ideal conclusion of Benedict XVI’s Christmas Triptych. This triptych began when Benedict XVI – during the Christmas Eve Holy Mass – asked for being «in a hurry for God’s thing, while the world has no space nor time for Him»; then, during the Christmas urbi et orbi message, Benedict XVI maintained that «our reverse omnipotence is defeated by the hope that is born»; and finally, in the December, 26 Angelus, the Pope indicated in Saint Stephan – who «allowed» Jesus to attract him – a model for the new evangelization. The Christmas triptych is so made up of three appeals to the faith of man, which are in the end also appeals for the World Peace. Because – the Pope always maintains – it is by knowing that God has become a man that we can undergo God’s face, and so we can undergo truth. And truth brings to Justice and Peace. The Pope said in his urbi et orbi message: «Yes, there is a good earth, a healthy earth, an earth freed of all selfishness and all lack of openness. In this world there is a good soil which God has prepared, that he might come to dwell among us. A dwelling place for his presence in the world. This good earth exists, and today too, in 2012, from this earth truth has sprung up! Consequently, there is hope in the world, a hope in which we can trust, even at the most difficult times and in the most difficult situations. Truth has sprung up, bringing kindness, justice and peace». This assumption was an introduction to the Pope’s prayer for the world peace – a prayer that can be also seen as a geopolitical glance to the «hottest places» in the world. «May peace spring up – the Pope said for the people of Syria, deeply wounded and divided by a conflict which does not spare even the defenceless and reaps innocent victims. Once again I appeal for an end to the bloodshed, easier access for the relief of refugees and the displaced, and dialogue in the pursuit of a political solution to the conflict». Then, the Pope prayed for Palestine, because the Redemeer «grant Israelis and Palestinians courage to end to long years of conflict and division, and to embark resolutely on the path of negotiation». Recently, Egypt approved the new Constitution, based and inspired on shari’a, the Islamic Law. And generally, there is much concern for the transition in the countries of the Arab Spring. Holy See officials asked for a nurturing of democracy, and are working to preserve Catholic communities, that are increasingly considered at risks. This is the background that brings the Pope to pray for North-African countries. «May citizens – the Pope said – work together to build societies founded on justice and respect for the freedom and dignity of every person». Asian scenario is also a complex one. People’s Republic of China has a new government, but relationships between Holy See and China are still difficult. Recently, China’s administration revoked the Episcopal appointment to Thaddeus Ma Daqin (now under house arrest), bishop of Shanghai, because he rejected the imposition of hands by an excommunicated bishop; did not drink from the same cup of the illicit bishop; publicly resigned from the Patriotic Association (PA) (the official Chinese Church), considering this an obstacle to his «pastoral and evangelization work». This was just the apex of a wide-spread tension in China. In his Christmas message, card. John Tong Hon asked for «universal suffrage and defense for the family». In his urbi et orbi message, the Pope prayed the «King of Peace» to «turn his gaze to the new leaders of the People’s Republic of China for the high task which awaits them. I express my hope that, in fulfilling this task, they will esteem the contribution of the religions, in respect for each, in such a way that they can help to build a fraternal society for the benefit of that noble People and of the whole world». Finally, the Pope prayed for Mali (plagued by a separatist war, that the local Church described as a «war of corrupted people») and Nigeria (where the bombings against Christian are unfortunately common news), for the Democratic Republic of Congo and Kenya («where – the Pope said – brutal attacks have struck the civilian population and places of worship»). 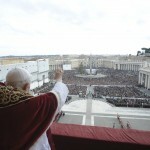 In the end, Benedict XVI turn is gaze to Latin America. «May the Child Jesus – he said – bless the great numbers of the faithful who celebrate him in Latin America. May he increase their human and Christian virtues, sustain all those forced to leave behind their families and their land, and confirm government leaders in their commitment to development and fighting crime». 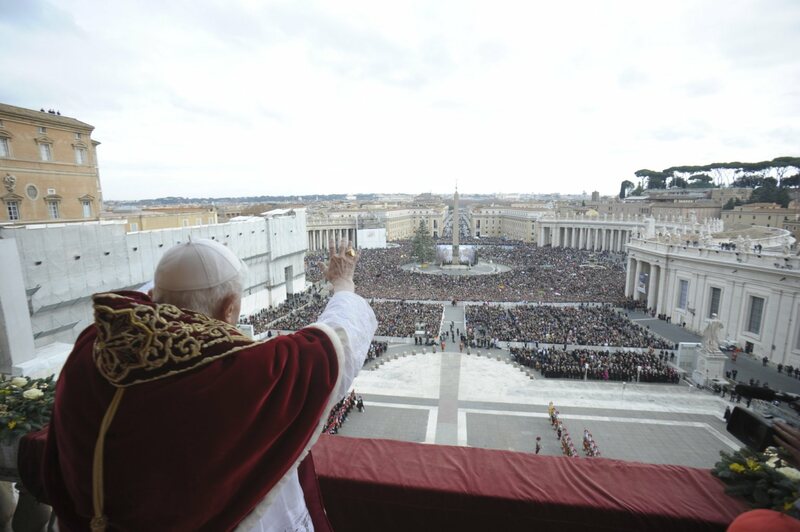 In fact, where God is denied – Benedict XVI maintained in his Christmas Eve Mass homily – there are war and violence. «If God’s light is extinguished, man’s divine dignity is also extinguished». When sometimes in history this light extinguished, religion «opposed to its deepest essence». Pope is not blind, he admits that «religions, especially monotheism, are the cause of the violence and the wars in the world». But he also responds asking «make room for him within ourselves», so that «we may recognize him also in those through whom he speaks to us: children, the suffering, the abandoned, those who are excluded and the poor of this world».